When I was three years old, I tripped on the wooden floorboards of my family’s small home in middle-of-nowhere Pennsylvania, my head landed on a nail that gashed my left eyebrow open. Far-removed from any town or decent phone service, my panicked parents rushed me to the closest hospital they could think of, praying their first-born daughter wouldn’t lose her eyesight from the accident. Nearly twenty years later, driving with my mother to that same house in the mountains, I heard Adrianne Lenker’s screaming voice in “Mythological Beauty” detail her own experience of toddler-age blood-gushing head trauma, and have since felt a deep-rooted connection to every note of her music in a way that only the most honest folk music can inspire. 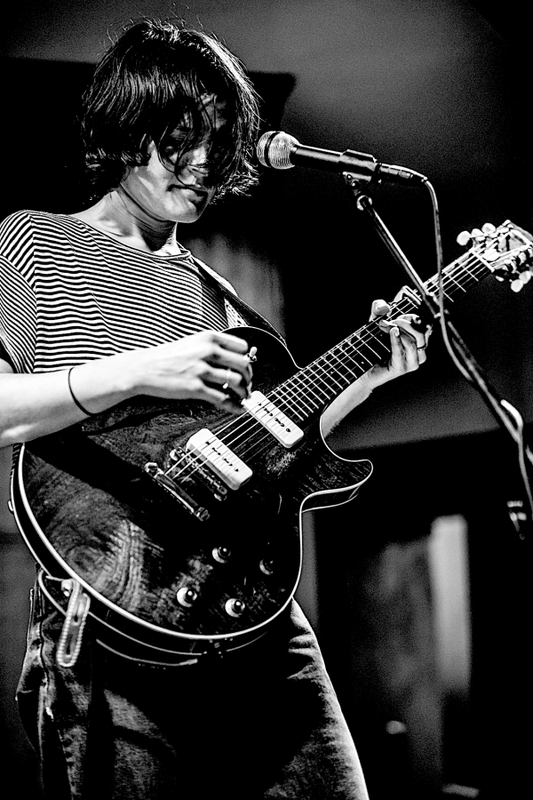 Lenker’s most recent work is her solo album abysskiss, but last night she made a stop in Philly with her band Big Thief, who took the stage at First Unitarian after a couple of fantastic opening sets from .michael. and The Range of Light Wilderness. After a polite hello to the crowd, Lenker looked around at her bandmates before plunging into “Real Love,” a song that undulates from gently quaking vocals to heavy power chords behind the more violent poetry. The tension Lenker sings of in the contradictions between her expectations and reality of real love culminate in a churning solo of guitar distortion that borders on noise rock. And as the crowd writhed along with her, she pulled the abstract notes into the intro of fan-favorite “Shark Smile,” a song that culminates with the plea “Take me, too,” when the singer’s lover dies in a violent car crash. Despite the rolling drums and curling comfort of Lenker’s high voice, Big Thief’s music is not for the light-hearted. The vulnerable grief on songs like “Paul” or “Masterpiece” from the band’s debut album only darkened in their 2017 release Capacity. Living up to the name, Lenker’s lyrics demonstrate a capacity for the human emotions we are most afraid to express – those that come from the stirring intersections of pleasure and pain, sorrow and happiness. As she sang “Pretty Things” and “Capacity,” with what looked like anguished effort, her bandmate Buck Meek watched with noticeable empathy that reminded the audience of the serious and often-ugly truths behind the heart-centering rhythms of the band. The live performance of Big Thief’s most cutting songs gives the music a new dimension. The person behind the pain becomes tangible, and the band twists around in motion with their immersive rhythms. Drawing inspiration last night from being in a place of worship where “energy is concentrated,” Lenker acted as guide for the band through the softest isolated vocals to startlingly quick kicks at the drum in songs like “Mythological Beauty” that made the entire room jump. But this is exactly what makes Big Thief so unique: Lenker’s intricate writing infused with a rhythmic harshness that is uncommon to most folk music. This entry was posted on Sunday, October 21st, 2018	at 5:00 pm	and is filed under News	. Responses are currently closed, but you can trackback from your own site.